Kohantei Hotel onsen in Toyako has a beautiful rotenburo (outdoor bath). The hotel is situated right along the lake so you have a fantastic view as you relax and soak in the bath. 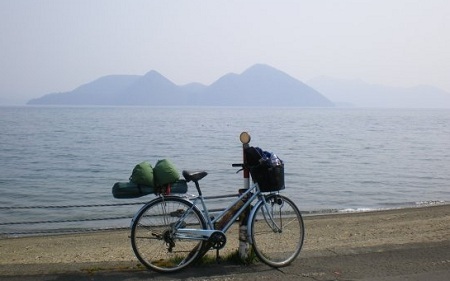 Toyako or Lake Toya is a famous lake in a National Park, Shikotsu-Toya National Park. Lake Shikotsu is also very beautiful and closer to Sapporo city. 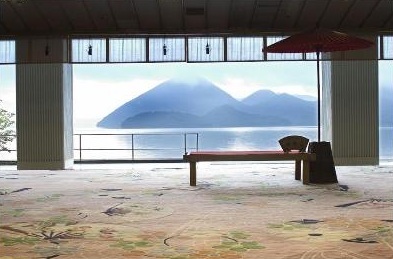 In 2008, the Windsor Hotel Toya Resort and Spa in Lake Toya was chosen to hold the G8 summit. 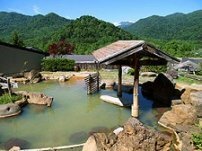 The rotenburo in the onsen (natual hotspring) is one of the best I have ever been to. The onsen is at the top of the building, on the roof. One of the rotenburos is on the outer corner, facing Lake Toya with a small garden in the open air. You can enjoy and soak in a large wooden barrel that can fit two people, but it is much more comfortable on your own. The other rotenburo is not as nice, but still has a decent outdoor bath. It’s under a roof and smaller, but still has a view of the lake and one wooden barrel. The men’s and women’s sides switch everyday between 1:30pm and 2:30pm so it depends how lucky you are to get the larger, better outdoor bath. We were there for two days so we were able to experience both sides. 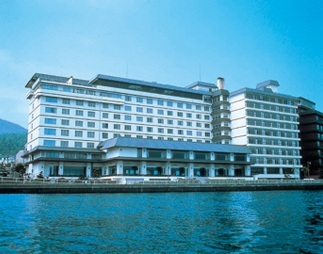 There are many large onsen hotels along the pedestrian walk way by the lake. However, some of them have closed down and are no longer used, so in the off season, the area is like a ghost town and a bit eerie. We went at the beginning of the summer so it was starting to get busy. The Kohantei Hotel was definitely the busiest and liveliest hotel there, so I was very glad that we had chosen this one over the others. The lobby was huge and the back walls had been opened fully to reveal Lake Toya. It seemed that the building was being held up only by pillars and we could see right through the hotel from the lobby entrance to the back of the hotel. Our room was a standard Japanese style room and was adequate enough for two people and very simple and clean, as Japanese rooms tend to be. The view from our room balcony on the 8th floor was breathtaking and we were able to move the lounge chairs outside to bask in the sun and watch the boats in the lake and the people stroll by underneath. 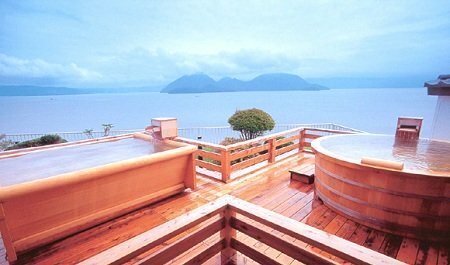 The price was just under 20,000 yen for one night for two adults. This included unlimited access to the onsen, a buffet breakfast and buffet dinner which was pretty good. They had all sorts of Japanese and some western food for dinner. There was very little Western food for breakfast, just croissants and fruit so if you don’t like natto (fermented bean curd, yuk! 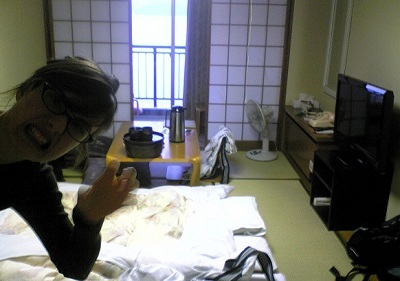 ), rice, baked fish, slimy squid, pickled vegetables etc, in the morning you might go hungry. There are many convenience stores nearby so you can get cheap snacks and drinks if you feel peckish at any time. You’ll see many of the hotel guests sitting outside on the benches in yukata (Japanese room gown) provided by the hotel. It’s a really relaxing atmosphere seeing everyone dressed in yukata. I kept mine on for the entire duration of our stay. Every night in the summer from July until August, there is a fireworks show on the lake, right in front of the hotel walkway, and is a nice end to a relaxing day. There are also ferry boats that take people to the island in the middle of Toyako. Some people take it and watch the fireworks from the lake. 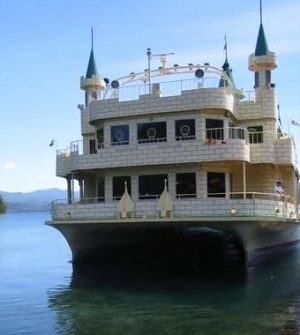 There’s one ferry boat that is so cheesy and tacky. It’s designed like a castle with parapets covered in bright yellow lights, with eerie music blaring out. You can go by train. Take a Limited express train from JR Sapporo Station via Chitose & Muroran Lines to Toya Station. It takes approximately 1 hr 40 min and costs 3,150 yen one way. From Toya station take a taxi to the hotel which takes about 10 minutes and costs about 1,000 yen. We rented a car and drove. The drive there is very beautiful and scenic and I highly recommend it as there are lots of nice places to stop off and walk around on the way, such as Jozankei, Rusutsu and Mount Yotei. Non-stop the drive takes approximately 2 hours and a half. A word of advice. Don’t take the toll roads, take route 230. They may be quicker but the view is ugly and it costs an arm and a leg! If you don't have a car and want to save some money take the free shuttle bus. To make a reservation book online or call the hotel directly. By the way it's cheaper to book online than to book directly through the hotel.